"Alan Brooke" redirects here. For British peer, see Alan Brooke, 3rd Viscount Alanbrooke. For Northern Irish peer, see Alan Brooke, 3rd Viscount Brookeborough. Field Marshal Alan Francis Brooke, 1st Viscount Alanbrooke, KG, GCB, OM, GCVO, DSO & Bar (23 July 1883 – 17 June 1963), was a senior officer of the British Army. He was Chief of the Imperial General Staff (CIGS), the professional head of the British Army, during the Second World War, and was promoted to field marshal in 1944. As chairman of the Chiefs of Staff Committee, Brooke was the foremost military advisor to Winston Churchill, the British Prime Minister, and had the role of co-ordinator of the British military efforts in the Allies' victory in 1945. After retiring from the army, he served as Lord High Constable of England during the Coronation of Queen Elizabeth II in 1953. His war diaries attracted attention for their criticism of Churchill and for Brooke's forthright views on other leading figures of the war. Alan Brooke was born in 1883 at Bagnères-de-Bigorre, Hautes-Pyrénées, to a prominent Anglo-Irish family from West Ulster with a long military tradition. He was the seventh and youngest child of Sir Victor Brooke, 3rd Baronet, of Colebrooke Park, Brookeborough, County Fermanagh, Ulster, Ireland, and the former Alice Bellingham, second daughter of Sir Alan Bellingham, 3rd Baronet, of Castle Bellingham in County Louth. Brooke was educated in Pau, France, where he lived until the age of 16: he was bi-lingual in French and English. He was also fluent in German, and had learnt Urdu and Persian. After graduation from the Royal Military Academy at Woolwich Brooke was, on 24 December 1902, commissioned into the Royal Regiment of Artillery as a second lieutenant. During the First World War, he served with the Royal Artillery in France where he gained a reputation as an outstanding planner of operations. At the Battle of the Somme in 1916, he introduced the French "creeping barrage" system, thereby helping the protection of the advancing infantry from enemy machine gun fire. Brooke was with the Canadian Corps from early 1917 and planned the barrages for the Battle of Vimy Ridge. In 1918 he was appointed GSO1 as the senior artillery staff officer in the First Army. Brooke ended the conflict as a lieutenant colonel with the Distinguished Service Order and Bar. Between the wars, he was a lecturer at the Staff College, Camberley and the Imperial Defence College, where Brooke knew most of those who became leading British commanders of the Second World War. From the mid-1930s Brooke held a number of important appointments: Inspector of Artillery, Director of Military Training and then GOC of the Mobile Division. 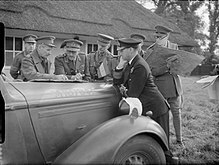 In 1938, on promotion to lieutenant-general he took command of the Anti-Aircraft Corps (renamed Anti-Aircraft Command in April 1939) and built a strong relationship with Air Marshal Hugh Dowding, the AOC-in-C of Fighter Command, which laid a vital basis of co-operation between the two commands during the Battle of Britain. In July 1939 Brooke moved to command Southern Command. By the outbreak of the Second World War, Brooke was already seen as one of the army's foremost generals. Following the outbreak of the Second World War, in September 1939, Brooke commanded II Corps in the British Expeditionary Force (BEF)—which included in its subordinate formations the 3rd Infantry Division, commanded by the then Major General Bernard Montgomery, as well as Major General Dudley Johnson's 4th Infantry Division. As corps commander, Brooke had a pessimistic view of the Allies' chances of countering a German offensive. He was sceptical of the quality and determination of the French Army, and of the Belgian Army. This scepticism appeared to be justified when he was on a visit to some French front-line units; and was shocked to see unshaven men, ungroomed horses and dirty vehicles. Brooke, GOC II Corps, with Major General Bernard Montgomery, GOC 3rd Division, and Major General Dudley Johnson, GOC 4th Division. He had also little trust in Lord Gort, Commander-in-Chief (C-in-C) of the BEF, whom Brooke thought took too much interest in details while being incapable of taking a broad strategic view. Gort, on the other hand, regarded Brooke as a pessimist who failed to spread confidence, and was thinking of replacing him. When the German offensive began Brooke, aided by Neil Ritchie, his Brigadier General Staff (BGS), distinguished himself in the handling of the British forces in the retreat to Dunkirk. In late May 1940 II Corps held the major German attack on the Ypres-Comine Canal but then found its left flank exposed by the capitulation of the Belgian army. Brooke swiftly ordered Montgomery's 3rd Division to switch from the Corps' right flank to cover the gap. This was accomplished in a complicated night-time manoeuvre. Pushing more troops north to counter the threat to the embarking troops at Dunkirk from German units advancing along the coast, II Corps retreated to their appointed places on the east or south-east of the shrinking perimeter of Dunkirk. General Sir Alan Brooke, C-in-C Home Forces (fifth from right, facing camera) inspecting a Light Tank Mk VII "Tetrarch" at the Staff College, Camberley, 6 January 1941. Then on 29 May Brooke was ordered by Gort to return to England, leaving the Corps in Montgomery's hands. According to Montgomery, Brooke was so overcome with emotion at having to leave his men in such a crisis that "he broke down and wept" as he handed over to Monty on the beaches of La Panne. He was told by Gort to proceed home .... for (the) task of reforming new armies and so returned on a destroyer (30 May). Then on June 2nd set out for the War Office to find out what I was wanted for with a light heart and with no responsibility, and was then told by Dill (CIGS) that he was to Return to France to form a new BEF; he later said that hearing the command from Dill was one of his blackest (moments) in the war. He had already realised that there was no hope of success for the Brittany plan (Breton redoubt) to keep an allied redoubt in France. He told the Secretary for War (Eden) that the mission had no military value and no hope of success although he could not comment on its political value. In his first conversation with Prime Minister Winston Churchill (Brooke had been rung by Dill who was at 10 Downing Street) he insisted that all British forces should be withdrawn from France. Churchill initially objected but was eventually convinced by Brooke and around 200,000 British and Allied troops were successfully evacuated from ports in northwestern France. After returning for a short spell at Southern Command he was appointed in July 1940 to command United Kingdom Home Forces to take charge of anti-invasion preparations. Thus it would have been Brooke's task to direct the land battle in the event of German landings. Contrary to his predecessor General Sir Edmund Ironside, who favoured a static coastal defence, Brooke focused on developing a mobile reserve which was to swiftly counterattack the enemy forces before they were established. A light line of defence on the coast was to assure that the landings were delayed as much as possible. Writing after the war, Brooke acknowledged that he also "had every intention of using sprayed mustard gas on the beaches". Brooke believed that the lack of a unified command of the three services was "a grave danger" to the defence of the country. Despite this, and the fact that the available forces never reached the numbers he thought were required, Brooke considered the situation far from "helpless" in case the Germans invaded. "We should certainly have a desperate struggle and the future might well have hung in the balance, but I certainly felt that given a fair share of the fortunes of war we should certainly succeed in finally defending these shores", he wrote after the war. But in the end, the German invasion plan was never taken beyond the preliminary assembly of forces. In December 1941 Brooke succeeded Field Marshal Sir John Dill as Chief of the Imperial General Staff (CIGS), the professional head of the British Army, in which appointment he also represented the army on the Chiefs of Staff Committee. In March 1942 he succeeded Admiral of the Fleet Sir Dudley Pound as chairman of the Chiefs of Staff Committee. Brooke (on the left) and Churchill visit Bernard Montgomery's mobile headquarters in Normandy, France, 12 June 1944. Brooke's focus was primarily on the Mediterranean Theatre of Operations. Here, his key issues were to rid North Africa of Axis forces and knock Italy out of the war, thereby opening up the Mediterranean for Allied shipping, and then mount the cross channel invasion when the Allies were ready and the Germans sufficiently weakened. Brooke's and the British view of the Mediterranean operations contrasted with the American commitment to an early invasion of western Europe, which led to several heated arguments at the many conferences of the Combined Chiefs of Staff. During the first years of the Anglo-American alliance, it was often the British who got their way. At the London Conference in April 1942, Brooke and Churchill seem to have misled General George Marshall, the U.S. Army Chief of Staff, about the British intentions on an early landing in France. At the Casablanca Conference in January 1943, it was decided that the Allies should invade Sicily, under the command of General Dwight D. Eisenhower, a decision that effectively postponed the planned invasion of Western Europe until 1944. The Casablanca agreement was in fact a compromise, brokered largely by Brooke's old friend Field Marshal Sir John Dill, Chief of the British Joint Staff Mission in Washington DC "I owe him [Dill] an unbounded debt of gratitude for his help on that occasion and in many other similar ones", Brooke wrote after the war. The post of CIGS was less rewarding than command in an important theatre of war but the CIGS chose the generals who commanded those theatres and decided what men and munitions they should have. When it came to finding the right commanders he often complained that many officers who would have been good commanders had been killed in the First World War and that this was one reason behind the difficulties the British had in the beginning of the war. 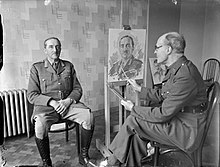 When General Sir Claude Auchinleck was to be replaced as the commander of the British Eighth Army in 1942, Brooke preferred Lieutenant General Bernard Montgomery instead of Lieutenant General William Gott, who was Churchill's candidate. Soon thereafter Gott was killed in an air crash and Montgomery received the command. Brooke would later reflect upon the tragic event which led to the appointment of Montgomery as an intervention by God. Earlier in 1942 Brooke had been offered the command of British forces in the Middle East. Brooke declined, believing he now knew better than any other general how to deal with Churchill. General Sir Bernard Montgomery in his staff car with General Sir Harold Alexander and General Sir Alan Brooke, during an inspection of the 8th Indian Division HQ, Italy, 15 December 1943. A year later, the war had taken a different turn and Brooke no longer believed it necessary to stay at Churchill's side. He therefore looked forward to taking command of the Allied invasion of Western Europe, a post Brooke believed he had been promised by Churchill on three occasions. During the first Quebec Conference in August 1943, it was decided that the command would go to General George Marshall. (Although in the event Marshall's work as U.S. Army Chief of Staff was too important for him to leave Washington DC and Dwight D. Eisenhower was appointed instead.) Brooke was bitterly disappointed, both at being passed over and of the way the decision was conveyed to him by Churchill, who according to Brooke "dealt with the matter as if it were one of minor importance". Statue of Field Marshal The Viscount Alanbrooke, Ministry of Defence Building, Whitehall, London. Brooke or "Brookie" as he was often known, is reckoned to be one of the foremost of all the heads of the British Army. He was quick in mind and speech and deeply respected by his military colleagues, both British and Allied, although his uncompromising style could make the Americans wary. As CIGS, Brooke had a strong influence on the grand strategy of the Western Allies. The war in the west unfolded more or less according to his plans, at least until 1943 when the American forces still were relatively small in comparison to the British. Among the most crucial of his contributions was his opposition to an early landing in France, which was important for delaying Operation Overlord until June 1944. He was a cautious general with a great respect for the German war machine. Some American planners thought that Brooke's participation in the campaigns of the First World War and in the two evacuations from France in the Second World War made him lack the aggression they believed necessary for victory. According to Max Hastings, Brooke's reputation as a strategist was "significantly damaged" by his remarks at the Trident Conference in Washington in May 1943, where he claimed that no major operations on the continent would be possible until 1945 or 1946. His diary says that he wanted operations in the Mediterranean to force a dispersal of German forces, help Russia, and thus eventually produce a situation where cross Channel operations are possible but that Churchill entirely repudiated (or half repudiated) the paper we (the CCOS) had agreed on; Harry Hopkins got him to withdraw his proposed amendments but that Churchill had aroused suspicions with his talk of ventures in the Balkans. During the years as CIGS, Brooke had a stormy relationship with Winston Churchill. Brooke was often frustrated with the Prime Minister's habits and working methods, his abuse of generals and constant meddling in strategic matters. At the same time Brooke greatly admired Churchill for the way he inspired the Allied cause and for the way he bore the heavy burden of war leadership. In one typical passage in Brooke's war diaries Churchill is described as a "genius mixed with an astonishing lack of vision – he is quite the most difficult man to work with that I have ever struck but I should not have missed the chance of working with him for anything on earth!" Shortly after Pearl Harbor, Churchill and his senior military staff used the Arcadia Conference in Washington to decide the general strategy for the war. The American Army Chief of Staff George Marshall came up with the idea of a Combined Chiefs of Staff that would make final military decisions (subject to approval by Roosevelt and Churchill). Marshall sold it to Roosevelt and together the two sold the idea to Churchill. Churchill's military aides were much less favorable, and Brooke was strongly opposed. However, Brooke was left behind in London to handle the daily details of running the British war effort, and was not consulted. The combined board was permanently stationed in Washington, where Field Marshall John Dill represented the British half. The Combined Board did have thirteen in-person full meetings, which Brooke attended. Seated in May 1943 around a conference table aboard the SS QUEEN MARY are, left to right: Air Marshal Sir Charles Portal, Admiral of the Fleet Sir Dudley Pound, General Sir Alan Brooke, Mr Winston Churchill. Prime Minister Churchill is presiding over the meeting at the end of the table. When Churchill's many fanciful strategic ideas collided with sound military strategy it was only Brooke on the Chiefs of Staff Committee who was able to stand up to the Prime Minister. Churchill said about Brooke: "When I thump the table and push my face towards him what does he do? Thumps the table harder and glares back at me. I know these Brookes – stiff-necked Ulstermen and there's no one worse to deal with than that!" It has been claimed that part of Churchill's greatness was that he appointed Brooke as CIGS and kept him for the whole war. Winston Churchill with Field Marshal Sir Bernard Montgomery and Field Marshal Sir Alan Brooke during the Prime Minister's tour of troops taking part in the Rhine crossing, 25 March 1945. Brooke was particularly annoyed by Churchill's idea of capturing the northern tip of Sumatra. But in some cases Brooke did not see the political dimension of strategy as the Prime Minister did. The CIGS was sceptical about the British intervention in the Greek Civil War in late 1944 (during the Dekemvriana), believing this was an operation which would drain troops from the central front in Germany. But at this stage the war was practically won and Churchill saw the possibility of preventing Greece from becoming a communist state. The balance of the Chiefs of Staff Committee was tilted in October 1943 when Admiral Sir Dudley Pound, Brooke's predecessor as chairman, retired as a result of poor health and Admiral Sir Andrew Cunningham succeeded Pound as First Sea Lord and naval representative on the Chiefs of Staff Committee. Brooke as a consequence got a firm ally in his arguments with Churchill. This was reflected in the most serious clash between the Prime Minister and the Chiefs of Staff, regarding the British preparations for final stages of the Pacific War. Brooke and the rest of the Chiefs of Staff wanted to build up the forces in Australia while Churchill preferred to use India as a base for the British effort. It was an issue over which the Chiefs of Staff were prepared to resign, but in the end a compromise was reached. The partnership between Brooke and Churchill was a very successful one and led Britain to victory in 1945. According to historian Max Hastings, their partnership "created the most efficient machine for the higher direction of the war possessed by any combatant nation, even if its judgments were sometimes flawed and its ability to enforce its wishes increasingly constrained". Brooke kept a diary during the whole of the Second World War. Originally intended for his wife, Benita, the diaries were later expanded on by Brooke in the 1950s. They contain descriptions on the day-to-day running of the British war effort (including some quite indiscreet references to top secret interceptions of German radio traffic), Brooke's thoughts on strategy, as well as frequent anecdotes from the many meetings he had with the Allied leadership during the war. The diaries have become famous mostly because of the frequent remarks on and criticisms of Churchill. Although the diaries contain passages expressing admiration of Churchill, they also served as a vent for Brooke's frustration with working with the Prime Minister. The diaries also give sharp opinions on several of the top Allied leaders. The American generals Eisenhower and Marshall, for example, are described as poor strategists and Field Marshal Sir Harold Alexander as unintelligent. Among the few individuals of whom Brooke seems to have kept consistently positive opinions, from a military standpoint, were General of the Army Douglas MacArthur, Field Marshal Sir John Dill, and Joseph Stalin. Brooke admired Stalin for his quick brain and grasp of military strategy. Otherwise he had no illusions about the man, describing Stalin thus: "He has got an unpleasantly cold, crafty, dead face, and whenever I look at him I can imagine his sending off people to their doom without ever turning a hair." Edited by the distinguished historian Sir Arthur Bryant, the diaries were first released (in abridged and censored versions) during 1957 (The Turn of the Tide) and 1959 (Triumph in the West). Originally the diaries were never meant to be published. One reason why Alanbrooke (as he had become) changed his mind was the lack of credit to him and the Chiefs of Staff in Churchill's own war memoirs, which essentially presented their ideas and innovations as the Prime Minister's own. Although censorship and libel laws accounted for numerous suppressions of what Alan Brooke had originally written concerning persons who were still alive, the books became controversial even in their truncated state. This was not only as a result of the many comments on Churchill and others, but also because they launched the idea of Brooke as being, ultimately, the sole commander behind the Allies' victory. Churchill himself did not appreciate the books. Alex Danchev and Daniel Todman attacked the two Bryant books as "travesties," "tendentious and mendacious" and published their own edition in 2001. Following the Second World War and his retirement from the regular army, Lord Alanbrooke, as he was now, who could have chosen almost any honorary position he wanted, chose to be the Colonel Commandant of the Honourable Artillery Company. He held this position from 1946 to 1954. In addition, he served on the boards of several companies, both in industry and in banking. He was director of the Anglo-Iranian Oil Company, the Midland Bank, the National Discount Company and the Belfast Banking Company. Lord Alanbrooke was particularly fond of being a director of the Hudson's Bay Company where he served for eleven years from 1948. Lord Alanbrooke was married twice. After six years of engagement he married Jane Richardson in 1914, a neighbour in County Fermanagh in Ulster. Six days into their honeymoon, the then Alan Brooke was recalled to active duty when the First World War started. The couple had one daughter and one son, Rosemary and Thomas. Jane Brooke died following a car accident in 1925 in which her husband was at the steering wheel. He married Benita Lees (1892–1968), daughter of Sir Harold Pelly, 4th Bt., and the widow of Sir Thomas Lees, 2nd Bt., in 1929. The marriage was very happy for the uxorious Brooke and resulted in one daughter and one son, Kathleen and Victor. During the war the couple lived in Hartley Wintney in Hampshire. After the war, the Brookes' financial situation forced the couple to move into the gardener's cottage of their former home, where they lived for the rest of their lives. Their last years were darkened by the death of their daughter, Kathleen, in a riding accident in 1961. Lord Alanbrooke had a love of nature. Hunting and fishing were among his great interests. His foremost passion, however, was birds. Lord Alanbrooke was a noted ornithologist, especially in bird photography. He was president of the Zoological Society of London between 1950 and 1954 and vice-president of the Royal Society for the Protection of Birds (RSPB) between 1949 and 1961. On 17 June 1963, Lord Alanbrooke suffered a heart attack and died quietly in his bed with his wife beside him. The same day, he had been due to attend the Garter Service in St George's Chapel, Windsor. Nine days later he was given a funeral in Windsor and buried in St Mary's churchyard, near his home in Hartley Wintney. Knight of the Garter (KG) in 1946. He also served as Chancellor of The Queen's University of Belfast from 1949 until his death. At the Coronation of Queen Elizabeth II he was appointed Lord High Constable of England, thus commanding all troops taking part in the event. In 1993, a statue of Field Marshal Lord Alanbrooke was erected in front of the Ministry of Defence in Whitehall in London. The statue is flanked by statues of Britain's other two leading generals of the Second World War, Viscount Slim and Viscount Montgomery. Garter-encircled coat of arms of Alan Brooke, 1st Viscount Alanbrooke, KG, as displayed on his Order of the Garter stall plate in St. George's Chapel, Windsor Castle. His coat of arms as issued to him by the College of Arms is: "Or, a cross engrailed per pale Gules and Sable, in dexter chief a crescent for difference." Welbeck College and the Duke of York's Royal Military School named one of their houses after him. Several military barracks are named after him, such as Alanbrooke Barracks in Paderborn Garrison, Germany,  and Alanbrooke Barracks in Topcliffe, North Yorkshire. Brooke was portrayed in the television drama Churchill and the Generals by Eric Porter and in the film Churchill by Danny Webb. ^ a b "No. 40557". The London Gazette. 9 August 1955. p. 4559. ^ Roberts (2008), p 12–13. ^ Roberts (2008), p 12. ^ Roberts (2008), p 14. ^ "No. 27528". The London Gazette. 24 February 1903. p. 1216. ^ a b Fraser (1982), pp.72–73. ^ a b "No. 29886". The London Gazette (Supplement). 29 December 1916. p. 20. ^ a b "No. 30563". The London Gazette (Supplement). 5 March 1918. p. 2973. ^ Mead (2007), p. 78. ^ Fraser (1982), pp. 135–140. ^ Mead (2007), pp. 78–79. ^ Caddick-Adams (2012), p. 235. ^ Brooke, p. 2 in "No. 37573". The London Gazette (Supplement). 21 May 1946. p. 2434. ^ Alanbrooke (2001), entres 29 May & 14 June 1940. ^ Hastings (2009), pp. 51–53. ^ Alanbrooke (2001), entry 22 July 1940. ^ Alanbrooke (2001), entries for 29 July and 15 September 1940. ^ "History – World Wars: The German Threat to Britain in World War Two". BBC. Retrieved 2012-10-14. ^ Dear and Foot 2005, pp. 131 & 711. ^ "Alanbrooke, FM Alan Francis, 1st Viscount Alanbrooke of Brookeborough (1883–1963)". Liddell Hart Military Archives. Retrieved 10 March 2016. ^ Alanbrooke (2001), entry 17 July 1942. ^ a b "What If the Allies Had Invaded France in 1943?". History.net. Retrieved 10 March 2016. ^ Alanbrooke (2001), entry 8 October 1941. ^ Alanbrooke (2001), entry 15 August 1943. See also entries for 15 June 7 and 14 July 1943. ^ Roberts (2008), p 140. ^ Hastings (2009), p 378–379. ^ Alanbrooke (2001), entry for 30 August 1943. ^ Winston S. Churchill (1948–1954). The Second World War, 6 vols. Vol. II. London, UK: Cassell. pp. 233–34. ^ Colville, John (1986). The Fringes of Power: Downing Street Diaries, 2 Vols. Vol. 1. London, UK: Sceptre. p. 530. ^ Alanbrooke (2001), entries for 8 and 19 August 1943, 28 September 1943 and 8 August 1944. ^ Fraser (1982), pp. 471–473. ^ Reynolds (2005), p. 405. ^ Fraser (1982), pp. 410–421. ^ Fraser (1982), p. 295. ^ Hastings (2005), p. 195. ^ Alanbrooke (2001), see for example entry for 4 November 1942. ^ Alanbrooke (2001), see for example entry for 20 November 1943. ^ Alanbrooke (2001), entry 14 August 1942. ^ A, Danchev and D. Todman. "The Alanbrooke Diaries." Archives-London-British Records Association 27 (2002): 57-74. ^ Fraser (1982), pp. 514–515. ^ Fraser (1982), pp. 55, 58, 92–93. ^ Fraser (1982), pp. 96–102. ^ "No. 37315". The London Gazette. 19 October 1945. p. 5133. ^ "No. 37407". The London Gazette. 28 December 1945. p. 1. ^ "No. 37461". The London Gazette. 8 February 1946. p. 864. ^ "No. 35793". The London Gazette. 20 November 1942. p. 5057. ^ Galloway (2006), p 433. ^ "No. 34365". The London Gazette (Supplement). 29 January 1937. p. 690. ^ "No. 37598". The London Gazette (Supplement). 4 June 1946. p. 2759. ^ "No. 39863". The London Gazette (Supplement). 26 May 1953. p. 2946. ^ "No. 36309". The London Gazette (Supplement). 31 December 1943. p. 42. ^ "No. 39347". The London Gazette (Supplement). 28 September 1951. p. 5112. ^ "No. 37725". The London Gazette (Supplement). 13 September 1946. p. 4628. ^ "No. 40265". The London Gazette (Supplement). 27 August 1954. p. 5006. ^ "No. 37803". The London Gazette (Supplement). 29 November 1946. p. 5893. ^ "No. 40937". The London Gazette (Supplement). 27 November 1956. p. 6775. ^ "No. 38997". The London Gazette. 18 August 1950. p. 4207. ^ "No. 41034". The London Gazette (Supplement). 27 March 1957. p. 1944. ^ "No. 38974". The London Gazette. 21 July 1950. p. 3751. ^ "No. 39008". The London Gazette. 1 September 1950. p. 4432. ^ "No. 41055". The London Gazette. 26 April 1957. p. 2520. ^ "No. 40020". The London Gazette (Supplement). 17 November 1953. p. 6230. ^ "No. 36200". The London Gazette (Supplement). 5 October 1943. p. 4441. ^ a b "No. 37761". The London Gazette (Supplement). 15 October 1946. p. 5140. ^ "No. 37761". The London Gazette (Supplement). 15 October 1946. p. 5144. ^ "No. 38288". The London Gazette (Supplement). 11 May 1948. p. 2921. ^ "No. 30631". The London Gazette (Supplement). 12 April 1918. p. 4523. ^ "Cidadãos Estrangeiros Agraciados com Ordens Portuguesas". Página Oficial das Ordens Honoríficas Portuguesas. Retrieved 3 August 2017. ^ "Alanbrooke Team Building". Welbeck Defence 6th Form College Website. Archived from the original on 10 February 2013. Retrieved 8 August 2013. ^ "Divided into ten houses". Duke of York's Military School website. Archived from the original on 19 August 2013. Retrieved 8 August 2013. ^ "Paderborn Garrison Labour Support Unit". Archived from the original on 15 July 2013. Retrieved 8 August 2013. ^ "Alanbrooke Barracks, Thirsk, North Yorkshire". streetmap.co.uk. Archived from the original on 2 June 2014. Retrieved 8 August 2013. ^ "Churchill and the Generals". IMDb.com database. Retrieved 8 August 2013. ^ "Churchill (2017)". IMDb.com database. Retrieved 16 March 2019. Brooke, Alan (1940). Operations of the British Expeditionary Force, France from 12th June to 19th June 1940. Alanbrooke's Official Despatch published in "No. 37573". The London Gazette (Supplement). 21 May 1946. pp. 2433–2439. These two books have been attacked as "travesties," "tendentious and mendacious" by A, Danchev and D. Todman. "The Alanbrooke Diaries." Archives-London-British Records Association 27 (2002): 57-74. Caddick-Adams, Peter (2012). Monty and Rommel: Parallel Lives. Arrow. Hastings, Max (2005). Armageddon. The battle for Germany 1944–45. Pan Macmillan. ISBN 0-330-49062-1. Hastings, Max (2009). Finest years, Churchill as Warlord 1940–45. Harper Press. ISBN 978-0-00-726367-7. Hart, BH Liddell. "Western War Strategy: A Critical Analysis of the Alanbrooke Diaries." Royal United Services Institution. Journal vol 105 #617 (1960): 52-61. Roberts, Andrew (2004). Hitler and Churchill: Secrets of Leadership. Phoenix. ISBN 0-7538-1778-0. Wikimedia Commons has media related to Alan Brooke, 1st Viscount Alanbrooke.